Filipino students continued their winning streak abroad by bringing home medals from two of the toughest math contests in China. 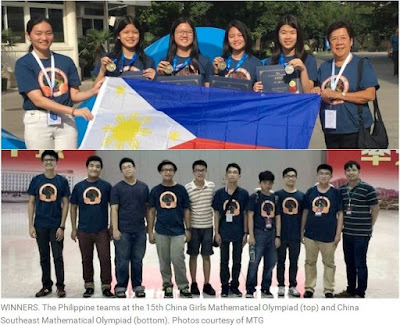 The Philippine teams won one silver and 3 bronze medals at the 15th China Girls Mathematical Olympiad (CGMO) in Beijing, and one silver and 4 bronze medals at the China Southeast Mathematical Olympiad (CSMO) in Jiangxi. In the CGMO, held from August 10 to 14, Tiffany Mae Ong, a Grade 11 student of British School Manila, won the country’s silver medal. Bagging bronze medals are Grade 10 students Angelika Joie Tagupa of Philippine Science High School-Main, Natalia Beatrice Dy of St John’s Institute in Bacolod City, and Jinger Chong of St Jude Catholic School, according to Dr Isidro Aguilar of the Mathematics Trainers Guild-Philippines (MTG). The students were accompanied by team leader Hazel Shi, and deputy team leader Sioc Bee Azajar, MTG Naga center coordinator and principal of Naga Hope Christian School. Joining the contest were teams from the US, Russia, Indonesia, Singapore, Hong Kong, Macau, Malaysia, Taiwan, the Philippines, and China. Matthew Angelo Isidro of St Jude Catholic School took home a silver medal in the CSMO, said team leader James Kevin Martin. Winning bronze medals are Vince Jan Torres, Sta. Rosa Science and Technology High School; Sean Anderson Ty, Zamboanga Chong Hua High School; Elijamin Wolfgang Claveria, Philippine Science High School-Main; and Vicente Raphael Chan, Zamboanga Chong Hua High School. Countries and territories that competed in the contest were China, Taiwan, Hong Kong, Indonesia, Macau, Mongolia, Malaysia, the Philippines, Russia, Singapore, and Thailand.